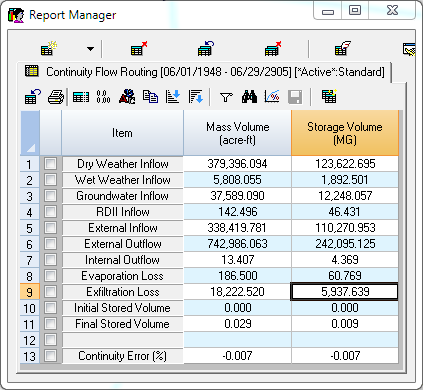 Subject:Create Watershed Data Using the InfoSWMM Subcatchment Manager The Subcatchment Manager of InfoSWMM will help calculate most of the physical parameters associated with a Watershed or Subcatchment in SWMM 5 from a Digital Elevation Data (Step 1). The Subcatchments slope is estimated from a slope raster (Step 2) and the Slope Calculator (Step 4). The created watershed area are calculated using the command Update DB from Map (Step 6) along with the Subcatchment Width (Step 3) and the Impervious Area (Step 5). The physical parameters estimated from the DEM are shown in Figure 1. 1/1. How does Conduit Lengthening Work in SWMM5? 2/1. How does Conduit Lengthening Work in SWMM5? 2/3 Check the Sum of the New Length - it will give you an understanding of the New Volume in the Model. You do not want to have a large increase in volume, plus longer lengths reduce the slope of the links which may cause problems.